This may very well be the closest thing to a courtroom scene we're going to get in EGS. I suppose I could have one eventually, but all the rules and proceedings would be based entirely on what I could figure out from watching reruns of Law & Order. The gender change aspect notwithstanding, I think there are a lot of people who can identify with liking the idea of suddenly assuming a party-ready version of themselves. I know I'd like to be able to do that. Of course, a lot of people try to achieve such results with alcohol, which I really wouldn't recommend. Adults drinking in moderation, sure, but I've been the sober guy at a party with a bunch of drunk people, and... no. Just... no. The latter half of the evening was like being in the only healthy person in the midst of some sort of bizarre plague. There have GOT to be better ways to have fun with a bunch of people than that. Putting my idiocy to work! I mentioned on twitterville that much of the dialogue in my comics are born simply from my characters pointing out the flaws in my own logic. 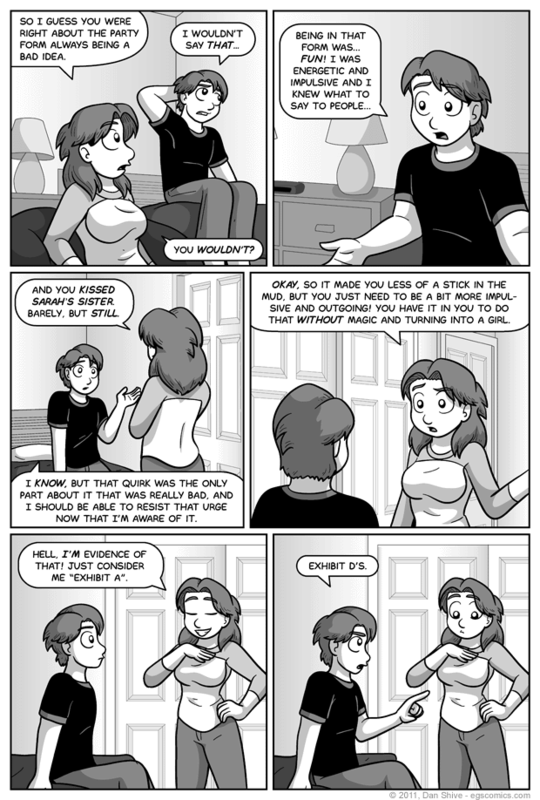 When originally planning this comic, I considered Ellen's argument to be as good as she seems to think it is in panel five based on the logic that she's a copy of Elliot. Then I remembered she was a magic female copy of Elliot, and... well, you see the result.